The SWEP provides FREE water education resources to teach water awareness and conservation to students, teachers and parents in Solano County. The in-class education programs as well as the resource materials and assembly programs are innovative, fun, multi-disciplinary and aligned to the content standards for California public schools for all grade levels (K-Twelve). SWEP’s offerings encourage students and adults to develop a healthy attitude of personal responsibly toward our environment and to develop skills needed to contribute meaningfully to the decision-making process on issues involving our resources, in particular conserving our most precious natural resource, WATER. 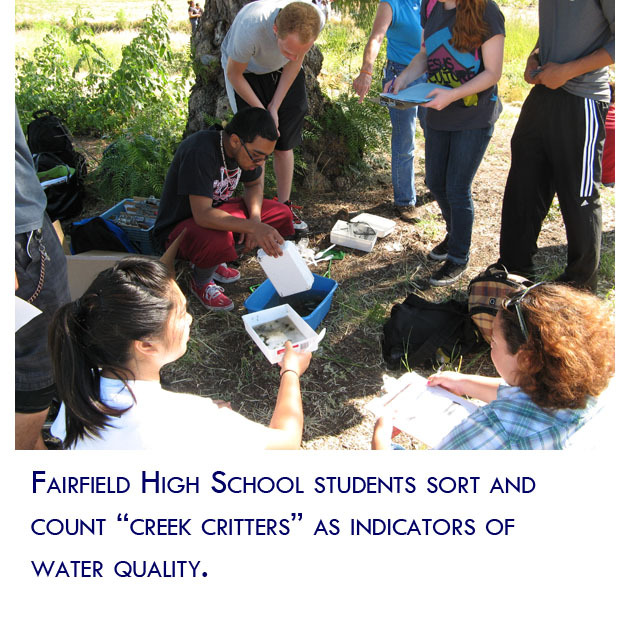 Seeking to raise the bar on environmental education, the Fairfield-Suisun Sewer District (FSSD), in cooperation with educators from the UC Davis John Muir Institute of the Environment, developed the Clean Water Outreach Program (CWOP) for secondary school students. 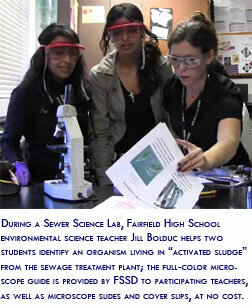 A high school curriculum that introduces students to wastewater collection and treatment. The curriculum revolves around a lab that simulates the wastewater treatment process, accompanied by water quality testing. This curriculum is based on the Bay Area’s Sewer Science program but was significantly modified to provide easy implementation and more direct correlation to science standards. A high school curriculum focused on studying urban runoff from school sites to local streams. Units feature activities like on-campus trash surveys, water quality testing, field trips to nearby creeks, and student-developed action projects to reduce stormwater pollution. A short curriculum that introduces middle school students to the science of sewerage and stormwater systems. The curriculum includes an introduction explaining the sources, paths, and destinations of sewage and stormwater, as well as lab activities. High school teachers are encouraged to use both Sewer Science and Curb2Creek in their classes to provide their students with a thorough understanding of water systems and how the sciences are applied to solve real-world problems in their own community. A set of teaching materials has been developed, including annotated Power Point presentations that describe the wastewater treatment process, relate the process to science standards, and provide step-by-step instructions about the classroom activities. The materials also include student worksheets, expected lab results, lab station instructions, and class posters that support the curriculum. See Sewer Science and Curb2Creek in Action! These short videos show Sewer Science and Curb2Creek in action. The videos show the teachers’ materials available and the high level of student participation.